Staying on top of your fitness routine during your prenatal journey has countless benefits. I am so excited to share the knowledge I have gained over the last five years training hundreds of Moms pre and post baby. 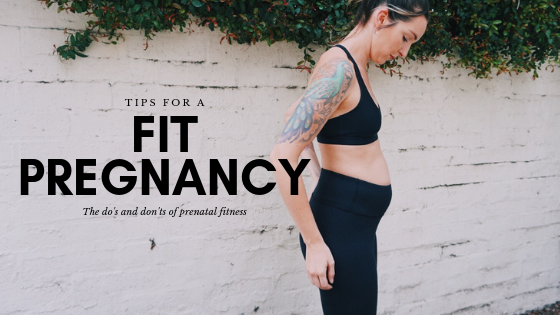 Typically, the first rule of thumb is if you were physically active before you were pregnant, it is likely safe to remain active during pregnancy. More than likely, your healthcare provider will tell you to remain active, as long as it is comfortable and there are no other health conditions suggesting otherwise.⁣⁣⁣ If you were powerlifting before, now is not the time to start your career. So often the only advice we here as Moms to be is: " Listen to your body" or " Take it easy". When in reality, there is a lot more to training safely leading up to giving birth. This program avoids exercises involving spinal flexion (like abdominal crunches) to reduce the risk of diastasis recti. You may have heard of the term "coning," my program is designed to avoid all unnecessary risks to you and your baby, while ensuring optimal health and fitness. After your first trimester, lying on your back can cause your uterus and growing baby to put major pressure onto the major vessel that returns blood to your heart. This reduces the blood flow to the placenta as well as to the rest of your body causing you to feel dizzy and potentially harming baby. DON’T PUSH THROUGH FEEL DIZZY OR LIGHT HEADED. REST AS NEEDED. Listening to the cues your body sends aka the ol’ “Listen to your body” mantra is something all moms are aware of. When it comes to your workouts you know what you were capable of performing prior to becoming pregnant. It will ultimately be up to you, and the advice of your physician to decide what workouts are safe/unsafe. Staying hydrated both before (ideally 30-35 minutes prior) and after your workout is important for the health of both you and your baby. Overheating can be a danger to not only you, but your unborn baby-not to mention that we already know that dehydration can make you feel weak and dizzy. If you feel weak and dizzy, you are more prone to hurting yourself during your workout. Aim for eight 8-ounce glasses per day (64 fluid ounces) of fluid, plus one 8-ounce cup for each hour of light activity. Try to stay active daily with 30 mins of cardio. Walking or swimming are great daily options. Movement is an important aspect of your overall healthy. Strive for 30 minutes of cardio of your choice daily. The cravings hit and nausea ruling your life? I get it. Hopefully it will pass and you will be feeling like yourself (well, your pregnant self) in no time. Do your best to stay balanced with your food intake and keep healthy options on hand. DO MAKE HYDRATION A PRIORITY. As a pregnant woman, you need more water than the average person, since water plays an important role in the healthy development of your baby. Water helps to form the placenta, which is what your baby relies on to receive nutrients during pregnancy. Water is also used to form the amniotic sac later in your pregnancy. Therefore, it is important to avoid dehydration during pregnancy. benefits of getting your workouts done. There are so many benefits from working out for both you, and your baby. Research shows that women who exercise regularly during their pregnancy gain 7lbs less than those who don’t. while still staying within the healthy weight-gain range. Other benefits include reduces risk of constipation, less aches & pains, AND more energy to get you through your day.